Passengers are welcome to board the ship in Amsterdam at 6:00 p.m. After comfortably settling into your cabins, we'll introduce our crew at a welcome cocktail. Join us on an excursion for both packages: Canal boat tour of enchanting Amsterdam at night. In the afternoon, join us on an excursion for both packages: Visit the Keukenhof Gardens(1). Outside the opening dates of the park, excursion to Volendam and the Zaanse Schans. The evening is free to do as you please. Our ship will cruise to Nijmegen through the night. CLASSIC: Visit to the Kröller Müller museum(3). DISCOVERY: Enjoy a great bike ride through the De Hoge Veluwe National Park(3). Our ship will cruise during the morning. When we arrive in Rüdesheim, join us on an excursion for both packages: Depart by tourist train and stop at a wine tasting cellar, followed by a visit to the Museum of Mechanical Musical Instruments. Our ship will cruise during the morning. Join us on an excursion for both packages: Visit of Heidelberg. Tonight is our gala dinner and evening. 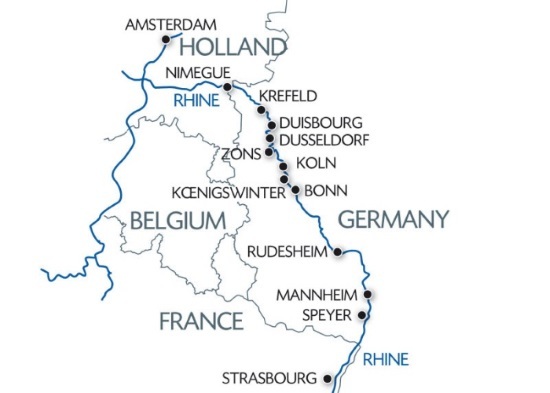 (2) Depending on available mooring, the stopover at Krefeld can be replaced with a stopover at Duisburg. (3) Except on Mondays: optional visit of the Dutch open -air museum in Arnhem.